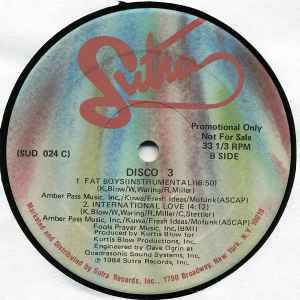 Produced for Kurtis Blow Productions, Inc. Engineered at Quadrasonic Sound Systems, Inc.
(P) 1984 Sutra Records, Inc.
Track A1 published by Amber Pass Music, Inc. / Kuwa / Fresh Ideas / Mofunk (ASCAP) / Fools Prayer Music, Inc. (BMI). Track A2 published by Fools Prayer Music, Inc. (BMI). B-side published by Amber Pass Music, Inc. / Kuwa / Fresh Ideas / Mofunk (ASCAP).